Australian Prime Minister Tony Abbott has begun steps to scrap the carbon tax, introducing a repeal bill at the first meeting of the new parliament. 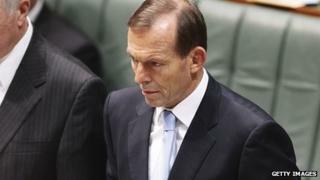 Mr Abbott, who was elected in September, had made revoking the controversial tax an election pledge. He intends to replace the tax with a Direct Action plan, where industries will be paid to reduce emissions. However, the bill is not expected to pass the Senate, where Mr Abbott's coalition lacks a majority. Australia's new parliamentary season began on Tuesday, with Liberal MP Bronwyn Bishop overseeing proceedings as the new Speaker. Introducing the legislation, Mr Abbott described the 7 September election as "a referendum on the carbon tax". "This is our bill to reduce your bills, to reduce the bills of the people of Australia," he added. The controversial tax, which was introduced under the previous Labor government, imposed a levy on the 300 biggest polluters. Australia is the developed world's worst polluter per head of population. But Mr Abbott said that the tax cost jobs and forced energy prices up. The bill is expected to be approved by Australia's lower house, where Mr Abbott's Liberal-National coalition has a majority. However, the opposition Labor party, which introduced the original carbon tax, and the Greens are both opposed to Mr Abbott's Direct Action plan, and say they will vote down the bill in the Senate. Senator and Greens leader Christine Milne said the government was destroying Australia's means of reducing carbon emissions. "When are we going to stand up and accept the science and act?" she said. The repeal bill cannot be passed without Senate approval. The new senators elected in September's polls, including those representing minor parties who may support the repeal, do not take their seats until July 2014. Mr Abbott's speech was interrupted by several shouting protesters, who were ejected from the public gallery.